The Bayview Opera House, a Cultural Center located in one of San Franciscos historically African American districts, has a longstanding commitment to serving neighborhood children and youth with after-school arts enrichment programs. Painter and muralist Eustinove P. Smith and other art teachers engage young students in art classes and workshops. Smith traces his artistic lineage back to intensely political and community-minded muralists. Socially-conscious public art provides communities with a healthy and productive expression of self-empowerment, history, and cultural equity. Bayview-Hunters Point is a community in great need of powerful public art that inspires social upliftment, says Smith. His mural making process involves the active engagement and participation of the children and youth and teachers he works with. 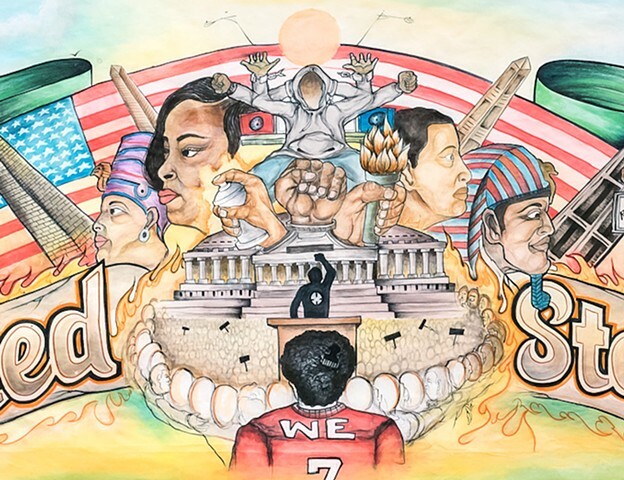 After months of brainstorming on current events, and doing several art assignments around self- identity, enrichment, and local history, the students, teachers, and Smith decided to create United We Stand, a mural that expresses some of the ideas advanced by the Black Lives Matter movement. In particular, United We Stand challenges police brutality and affirms the value of young Black lives in inner cities around the country, and honors Black history and culture. Students contributed richly to the concept, messaging, and design of United We Stand. Smith created prepartory drawings, and distributed them to students who then added their own color schemes, messaging, and additional content. Students also created collages to plan the content and composition of the mural. Smiths large prepatory drawing will eventually be painted on a 60-ft. wall at the Dr. Charles Drew College Preparatory Academy in San Franciscos Bayview neighborhood.